The platypus and echidna are the only two egg-laying mammals in the world and these characteristics identify them as monotremes. Today we had the opportunity to learn more about them at Platypus House in Tasmania’s far north. 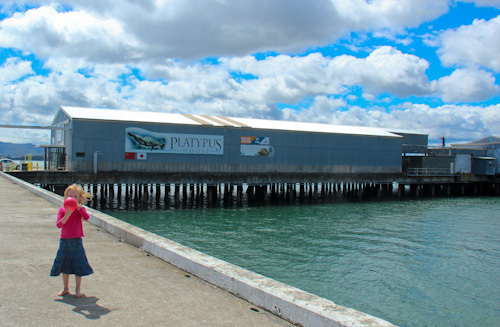 Platypus House sits on the pier at Beauty Point — a misnamed town and possibly the only ugly township in Tasmania. 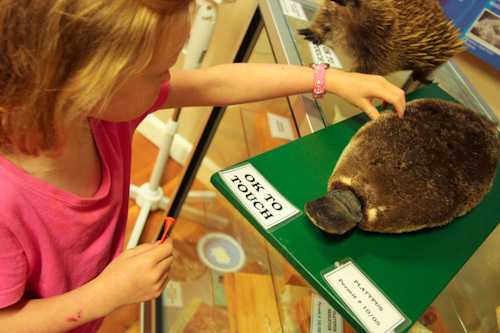 Visitors to Platypus House are taken on tours through its rooms after first watching a video on platypus nesting habits. Our guide today was Lyndall, and she was an excellent fount of knowledge, weaving the usual litany of facts and figures with her own personal anecdotes. Thank you for clear signage! This is the first time we've encountered exhibits that say "OK to touch", and it's wonderful to offer them to children instead of jumping as they reach out to finger something forbidden. 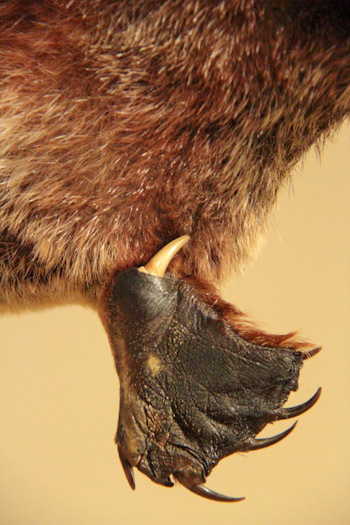 The spur on the hind leg of the male platypus contains enough venom to kill rival platypus males — and to hurt a human for several months. 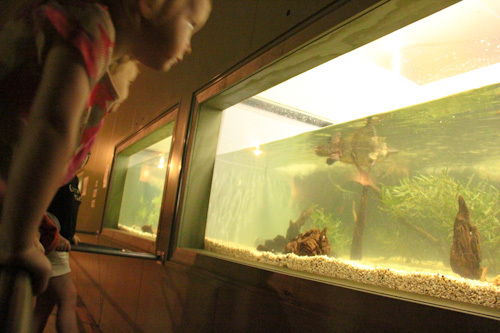 We are ushered into a dark room with a well-lit tank where four young platypus play together. 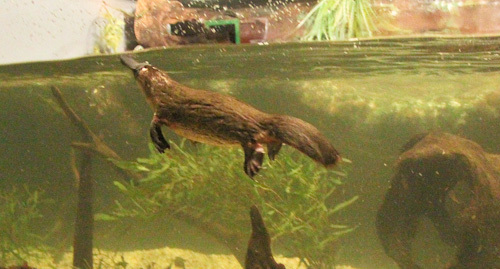 The platypus are fed during each tour — mimicking their constant grazing habit in the wild. As air-breathing mammals, the platypus surface about every minute. They leave a trail of bubbles when they submerge — this is the tell-tale sign for platypus-watchers in the wild. When we're invited to feed the platypus, Brioni accepts a live earthworm. But instead of throwing it to the platypus, she hides it away — rescuing it from certain death. 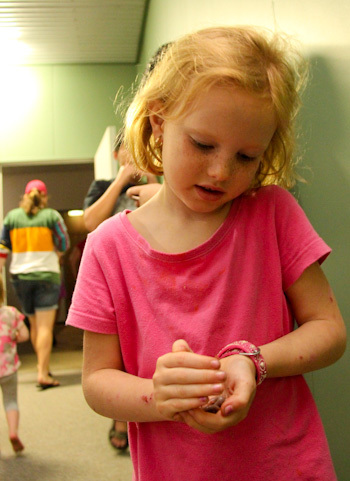 After leaving the platypus rooms, we enter one with three echidnas named Eddie, Edwina and Thomas. 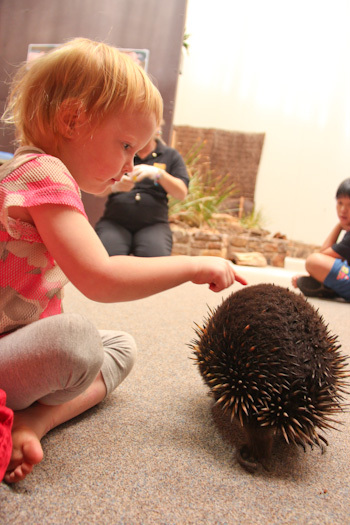 Sexing an echidnas is notoriously difficult — impossible, in fact, until the female lays eggs and grows a pouch — and so the staff at Platypus House have ironically misnamed both Eddie and Edwina, and Thomas’ gender is yet to be determined. 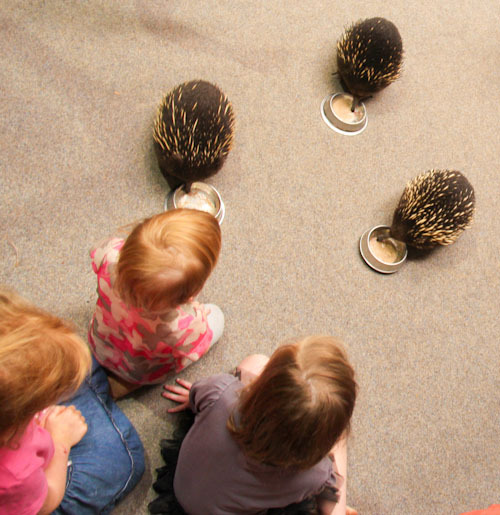 In the echidna room, we're invited to sit on the ground and observe the echnias eating up their meal of mixed cereal, ants and meat. A full-grown, short-beaked echnidna — such as those found in Tasmania — have tongues between 30 and 45 cm in length. 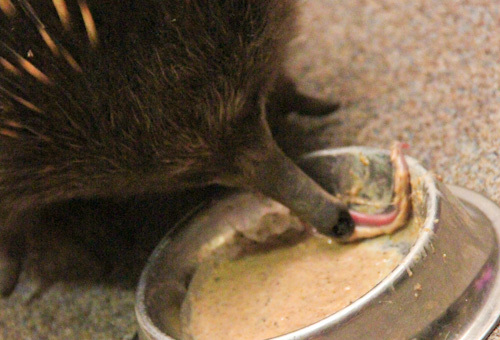 After they're finished eating, the echidnas wander around their room, and we marvel at their backward-facing rear feet. 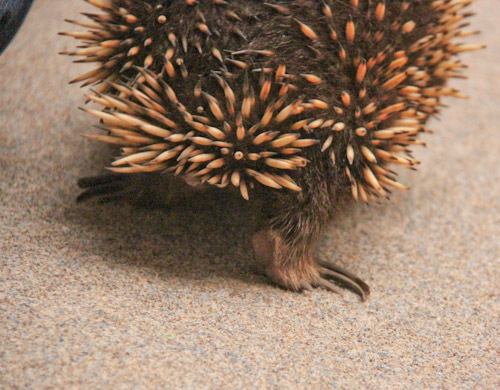 Unlike porcupines, echidnas don't shoot their spines into other creatures. They're safe — but spiky — to handle, and we reach out to feel their spines that are really just overgrown hairs. We are satisfied with our encounters with these fantastic and rare Australian animals once we leave Platypus House. A visit to this attraction is highly recommended, and we have lots to think about — and the hope of seeing platypus in the wild — in the next few months! 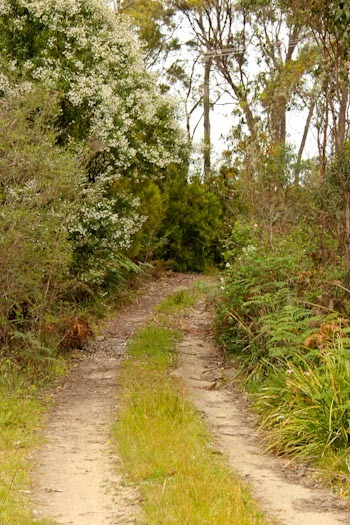 A track into the bush beckons me. I walk it to check its appropriateness for overnight parking before we drive down to a clearing and turning circle — all out of sight of the road. It's our first night of bush-camping in Tasmania. This unmarked free-camping location is just north of Andersons Creek on Greens Beach Road, on the eastern side of the road. It must be used by locals for accessing the estuary and fishing, as I noted the remains of several fires. It’s a lovely, remote spot for a night or two of camping, and it’s right on the water, although access to the water is muddy at low tide. That’s wonderful that they got to visit the monotremes :D Have you and your girls heard of Snapshot Serengeti? 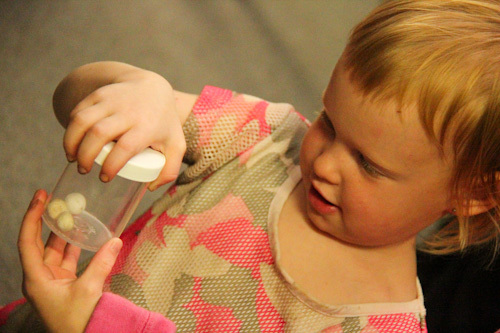 It’s a great learning tool (that contributes to science) that they could explore on their kipis. I heard about it on the US public radio and thought of y’all immediately. You will love the Beaconsfield Mine Museum just down the road from where you are. Loads of hands on stuff. Mole Creek is where we saw a Platypus in the wild. It’s a lovely camping spot too. Oh Lauren – your stories are making me ache for Tasmania!! I hope you continue to have heaps of fun! Porcupines don’t actually shoot their quills. They have barbed quills that easily detach and that they will bristle in self defense. When the quill comes into contact with something, such as another animal, the quill will push into the skin and then the barbed end catches making it hard to remove. Thus, why dogs or other animals may dig at the stuck quills but they can only be safely removed by a vet or doctor. Sorry to go all nerdy Biologist on you. I love that this place was available to you and the girls to explore. It seems like an amazing place. Take care! WOW!! Thanks for sharing I just learned a lot from your post. I am from the US and didn’t know much about platypus. That is cool about the male platypus and the venom!! Again thanks for sharing! Amazing- I really admire the fact that they have the ability to learn “hands on” instead of simply being told something inside a classroom. I always kind of thought that Aussies saw koala, roos, and platypus in the wild like we see deer, racoon and squirrel. It is true what the other person said about porqupines, except that they can be removed by the adventurous pet owner with a solution of sodium bicarbonate, which softens the quill and enables the barb to loose its grip. Loved the delightful sounds of bedtime on the video – but it’s all black for me – is that a problem on my end?